Chris Rodell's writing has appeared in publications including Sports Illustrated, Esquire, Men's Health, Golf, and Arnold Palmer's Kingdom Magazine. The legendary golfer Gary Player has won nine major tour championships and became the third golfer in history to win a career grand slam. He resides in Jupiter Island, Florida. Each sport has its heroes, those unique talents whose exploits become modern mythology to those who follow in their footsteps. Even as their records fall, these special athletes retain their status as legends. Their names transcend sport, as their successes and personalities etch their place in history. Nobody represents this rarified iconic status more than Arnold Palmer. 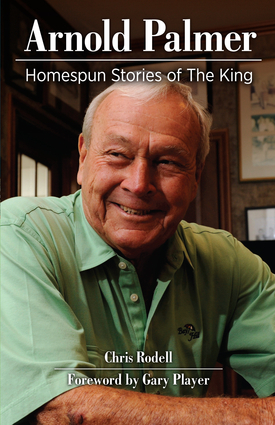 Arnold Palmer: Homespun Stories of The King introduces fans not to the iconic personality they’ve long admired, but to the neighbor they never knew. Rodell’s perspective is equal parts journalism and fan mail, combining a professional approach with a relatable, accessible voice. Both golf historians and the younger generation of fans will find value in this enlightening, engaging portrait of Palmer. No golfer’s library is complete without it. Chris Rodell's writing has appeared in publications including Sports Illustrated, Esquire, Men's Health, Golf and Arnold Palmer's Kingdom Magazine.